Thanksgiving is the one holiday of the year where I cook a big feast for the whole family, which can vary from five to twenty people, depending on who is in town. What makes cooking this meal a challenge are the dietary quirks of just about everyone. Some people don’t drink alcohol; some don’t eat cheese; one can’t eat fat (no gallbladder – I know, too much information); some are diabetic. But the biggest challenge is the group of vegetarians. 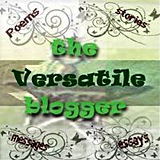 I am a die-hard carnivore, and I like to plan a meal around the meat, with the vegetable dishes as a complement to it. With no meat, I flounder around trying to think up enough dishes so that everyone will be full and satisfied. This year it turned out that all the vegetarians came on Thursday, and the carnivores came over on Friday, so it worked out great. Friday I roasted a turkey, with dressing, mashed potatoes, gravy, cranberries, and all the beautiful vegetable dishes from Thursday. Everyone got stuffed to groaning both days, and I was so happy to have put them into that state. 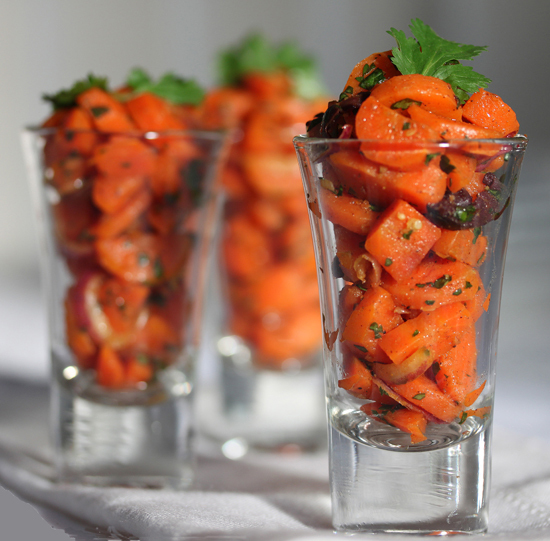 I didn’t serve the Carrot Salad in those little shot glasses. It was in a big bowl. But the little glasses are much more fun for the photograph. And, yes, that was their real color. 1. Combine the carrots, water and garlic in a medium saucepan and heat to a boil. Cover and cook over low heat until carrots are crisp tender, about 6 minutes. 2. Uncover carrots and simmer over medium-low heat to evaporate any excess water. Transfer to a serving bowl and cool slightly. 3. Sprinkle the raz el hanout into a small skillet and heat until the spice mixture releases its aroma, about 30 seconds. Remove from the heat. 4. Whisk the olive oil, lemon juice and salt into the spices until blended. 5. Add dressing, red onion, olives and cilantro to the carrots and toss to combine. Let stand at room temperature up to 2 hours, or until ready to eat. Combine all spices in a small bowl and use 1 ½ teaspoon of mixture in recipe above. Those carrots looks delicious, and nice presentation! I’m going to experiment and adapt this recipe and pickle some carrots using the spice blend you shared in this post. Beautiful pictures and I agree the shot glasses were a fun way to photograph the dish. These look so gorgeous… love that you put them in glasses… that color is spectacular! I served this carrot dish warm as a side to the Moraccan-Style Chicken Pie from epicurious.com at a dinner party for 12. The carrots complemented the Chicken Pie well. The best part was that I made them both a head of time. Hi Lynne, Moroccan and Algerian are two of my favorite cuisines. And your carrots look really wonderful. I’ll be sure to try them soon (beets are on the menu today). I’ve made something similar — only served it hot as a side dish. Wonderful idea to serve it chilled as a salad, especially in summer.